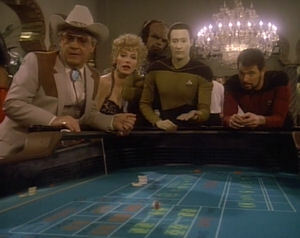 Riker, Data, and Worf beam down to a hostile planet only to find themselves trapped in a second-rate novel set in a Vegas hotel. The proof for Fermat's Last Theorem was found in 1995 by a British mathematician named Sir Andrew Wiles. Of course, in 1989, when this episode aired, the writers couldn't have known that was going to happen and had every reason to believe that it would be unlikely, given that the theorem had remained unsolved for over 350 years. Riker is strangely unconcerned with losing the ability to communicate with the Enterprise. It takes him way too long to try to go outside to tell the ship what's going on. He'd have to know that Picard is worried. Both Data and Picard note this odd choice, which is good, but the writers refuse to offer an explanation for it. I love that Worf calls the elevators "turbolifts." The idea of spending 38 years in the Hotel Royale really does sound like Hell. I'd love to see it explored more what that could do to a person, psychologically speaking, though of course there's no time for that in this episode. It'd be even more interesting if he'd gotten out and back into the real world, because then he'd start to see the people around him as the same type of "cliché and badly written" characters that existed in the Hotel Royale. The bit with Worf talking on the phone with room service is pretty funny. Do they really need the cheesy music? There's a lot of neat ideas in this episode, but it seems to me that the story never quite decides on an appropriate tone. You have the goofiness of the deliberately bad writing expanded by tongue-in-cheek acting, cute jokes, and the aforementioned music, but then you have the scene with the rotting corpse and the diary of a man forced to live at least 38 years of psychological torture. There's at least two stories in here, one terrifying and one amusing, but trying to squeeze them both into 45 minutes just doesn't work out as well as it could. As I understand it, this episode was the victim of too many rewrites, that most of the cast and crew believe the original script was much better than the one that got filmed. You can really sense that. DS9 tries to retcon an explanation for why Picard is working on Fermat's Last Theorem in the episode "Facets." Other trippy TNG episodes: "Remember Me," "Cause and Effect," "Frame of Mind," "Parallels," and of course, "All Good Things..."